Taking a long, hot, soothing shower can relax you and ease all your troubles, don't you feel that way too? It is easy to afford a luxury shower when in your home or at a high-end hotel, but is it possible to have a fantastic shower experience while enjoying the outdoors? We have set out to find the best RV shower head that will allow for more than satisfying showers while camping and enjoying the nature. The best RV shower head can help your RV shower experience become an enjoyment you never dreamed it could be! Read on and find out how the best RV shower head can make your future camping trips even more enjoyable! What Should You Know About the Best RV Shower Head? Is the Water Pressure Important? Are Handheld Shower Heads Better Than Regular Shower Heads? Does the Best RV Shower Head Save Water? 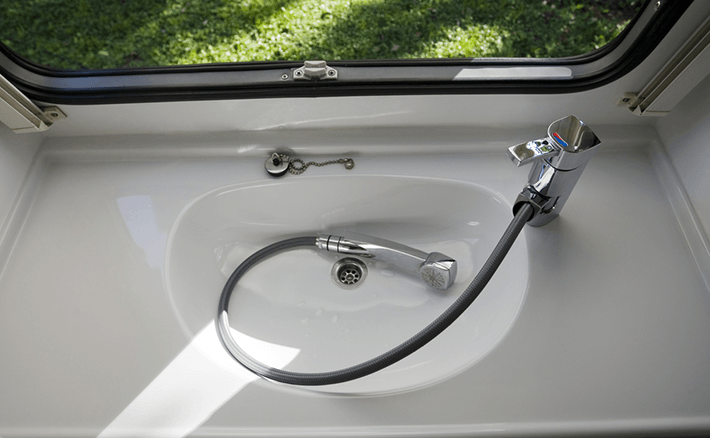 Your RV probably came equipped with a shower head in the first place, but it probably is not the best one you could have, is that right? Most standard RV shower heads do not ooze quality, but are, quite the opposite, made from cheap plastic and offer minimum water pressure. In short, standard RV shower heads do not secure a pleasurable shower experience but rather leave you struggling with basics such as rinsing the shampoo out of your hair. Luckily for you, RV shower head upgrade is neither a complicated nor expensive modification. Water pressure is always a key ingredient when it comes to good shower experience. Although RV shower heads cannot come close to the standard ones when it comes to the water pressure due to water restrictions imposed by the camping conditions, they can still offer a strong water stream that will secure a good shower in reasonable time. It is important to check the RV shower head water pressure as its performance will depend on it. For example, some of the best RV shower heads will use air and mix it in the stream for higher pressure thus producing a stronger spray with less water which definitely makes them a BEST BUY option. A regular shower head can be quite impractical in the RV no matter how well the angle of the spray can be adjusted. On the other hand, a handheld showerhead will function as well as the regular one and offer you with a number of other possibilities that a regular one never could. You can clean the bathroom, wash your pets or shower your kids without any problems. You could never do all this with a regular shower head due to it being fixed at a certain height. Handheld shower heads are a better choice for the RVers since camping equipment has to be as versatile as possible. For comfortable camping experience read more about pop up campers with bathrooms! RV water saving shower head is a holy grail when it comes to dry camping. When water supplies are limited, a shower head that saves water can be a lifesaver, especially if it still provides reasonable water pressure. You have to be aware that standard RV fresh water holding tanks are far smaller than the ones at your home (ONLY about 6 to 10 gallons). There is another reason why RV water saving shower head is so desirable- it is environment-friendly! We all know that preserving the environment is a must for most nature-loving RVers who appreciate all the beauty of the outdoors. Conserving water is a simple way to say thank you for all the beauties nature has provided us with, so why not do it? Therefore, the answer is YES! The best RV shower head saves water. A reliable flow stopper (water shut-off valve), WaterSense certification, and low flow per minute (GPM rating) are thus all very important features that need to be taken into the account when buying the best RV shower head. EXTRA INFO: A Water Saving RV Shower Head will save your money too! Less water used to take a shower will result in less frequent water tank change and more money in your pocket- it is as simple as that! Although not necessarily an RV shower head, this AquaDance model is sure to make you a happy camper, especially if you are on a rather tight budget. The head itself is made of plastic, and although it is advertised as Chrome Plated Premium ABS or the highest grade plastic, it does appear a bit flimsy. On the bright side the five-foot-long hose is made of stainless steel and very flexible. The hose nuts are brass and sure to last. The shower head feels light in hand, but due to an ergonomic grip handle, it is very comfortable to hold. The showerhead comes with an angle-adjustable overhead bracket too, and you can use it as an overhead shower when needed. Due to a Click-Lever Dial, you can easily change the water spray setting (there are six options to choose from). The AquaDance is easy to install as it will fit any standard shower arm, and if you ever encounter an issue, there is a limited lifetime warranty that eliminates all the worries. To top things up, there is a water saving pause mode that will help you use your resources wisely. HOMELODY is another shower head suitable for use in RVs. It costs almost double the price of the previously reviewed model considering the fact that you only receive the actual shower head but no hose or set up equipment. You should, therefore, plan ahead and set aside some additional money for a set of standard shower accessories and installation kit. On the bright side, HOMELODY shower head is sure to save you a lot of money thanks to the practical water-saving push button. The button also eliminates the need to close the valve when re-adjusting the water temperature, or making a pause during your shower. It is especially convenient when bathing a kid or a dog too. There are five settings, including four different massages and a very invigorating and pleasant power mist setting. The shower head is made from ABS plastic, but there is a 10-year warranty to vouch for the quality and durability of this unit as well as cUPC Certification which confirms that this unit is safe and does not endanger your health. Oxygenic ETL 26781 RV shower head is a fair priced unit that will provide you with excellent water pressure whenever you need an energizing shower in your RV. The pressure is that good due to the air being mixed with the water stream. The self-pressurizing Oxygenics Body Spa shower is actually quite famous among RVers. There is an option to restrict water flow that aims to conserve water (while you soap your hair and body for example) but the problem is that this is not an RV shower head with shut off valve and there is no option to stop the water flow completely. If you are worried, do not be; this shower head is WaterSense certified and is sure to contribute to your efforts to preserve the nature and its resources. The mount allows for angle adjustment. There are two drawbacks- a very rigid and inflexible hose and a single (unchangeable) water stream setting. On the plus side, the unit is easy to install and comes with a lifetime warranty against failure and clogging. The design is very attractive and modern too. Camco 43714 RV Shower Head Kit includes a showerhead, 60" flexible hose, as well as the wall mount and all the hardware needed for the installation. It is reasonably priced, especially considering the fact you get all you need to start using it right away. The installation is a breeze as well. This is another RV shower head with an on/off switch. The On/Off switch will enable you to pause the water flow while shampooing and thus help you save both water and money but is, unfortunately, not always easy to use. Namely, the button is often hard to move, especially with slippery hands, and can even get stuck sometimes which can be quite annoying. The water pressure is not very strong either, especially in RVs, which makes the choice of five different water stream settings almost obsolete as you cannot tell them apart. On the bright side, the shower head is quite large and the handle is ergonomic and sits well in your hand. This Camco RV shower head is also pretty silent which can be very important for some users who like to relax during their shower time. Five spray patterns are supposed to massage you, but you cannot really feel it. Although the cheapest RV shower head reviewed here, this unit is rather well made and offers a lot for the money paid. It is made from plastic, but is well designed and appears quite luxurious due to the brown rocks and chrome bezels. The package includes the Ionic shower head, replacement hose, anti-scale plate, and the teflon tape but the holder needs to be bought separately. The biggest complaint is that this is not a water saving shower head- there is no flow reductor or shut-off valve to pause water flow which is quite essential when dealing with the limited water supply in your RV. On the bright side this is a unique model which has a double filter system that is supposed to make your skin and hair softer. The infrared mineral stone and negative ion mineral stones are said to reduce the chlorine as well. The unit is easy to install, produces a good water pressure and offers three invigorating shower modes- Rainfall, Jetting, Massage. It is easy to clean too. There is a lifetime warranty which gives you a sense of security as well. HOMELODY Handheld RV Shower Head is the top choice due to the fully functional water flow pause feature, good water pressure that is sure to speed up your shower and make it more pleasurable, plus five excellent water stream settings that can massage you after a busy camping day. If you aim to be a happy camper you should replace the existing shower head in your RV as they are all quite bad. Any of the reviewed models is going to be a great improvement, so do it and see it for yourself!